Joseph Athanase Tchamala Kabaselleh a.k.a Le Grande Kalle was the first great Congolese musician. He is considered the Father of modern Congolese music.He was born on Dec 16 1930 in the city of Matadi which is the capital of the Congolese province of Bas Congo. He founded L’Africa Jazz in 1953 which turned out to be the first great Zairean band. At its height , Africa Jazz boasted the likes of Docteur Nico kasanda , Tabu Ley, Manu dibango and Jean Serge Essous. Prior to forming L’Africa Jazz, Grand Kalle played in a band called OTC that was led by one George Doula. This was a band that played a fusion of tradition African rythms. Tired of the lack of modernization at OTC and eager to experiment, Kabaselleh left OTC to form Africa Jazz. He was the first Congolese musician to incorporate elements of modern music such electric guitars, saxphones, tumba and other electronic devices. Being a leading figure in Congolese social life , he was chosen to accompany a delegation to the round table talks to secure independence from Belgium. 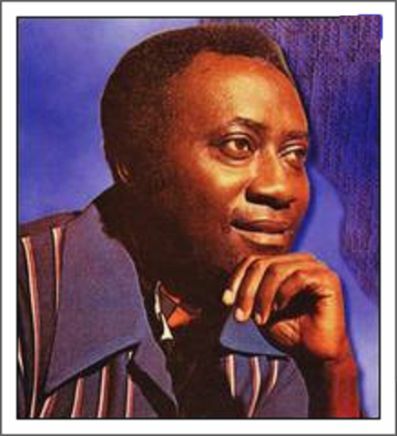 He stamped his place in history when in 1960 he composed the song Independence Cha cha which was adopted as the national anthem of Congo as well as several other newly independent nations. Africa jazz tapped the publics taste for foreign music by fusing elements of latin music with African rumba , producing a latin flavour. His music appealed especially to self styled intellectuals of whom Kalle was one having been educated to secondary school level.At its height, Africa Jazz boasted Tabu Ley, then the best vocalist in Congo, Nico Kasanda, the founder of the ubiquitous Congolese guitar style and Manu Dibango, the legendary Cameroonian Saxophonist. Kalle suffered a major setback when in the mid 60s , two of his prodigies, Tabu Ley and Docteur Nico left to form their own band which they named Africa Fiesta. He never recovered from that setback and his career took on a downward spiral from that moment on. Instead he focused on nurturing the career of his prodigee Pepe Kalle who turned out to be one of Africa’s most celebrated singers of the 80s and 90s. Pepe Kalle apparently lived in Kabasselleh’s home for a period during his childhood. Le Grande Kalle died in a Paris hospital on February 11 1983. He was buried in Gombe cemetery in Kinshasa. It was he who first fused Cuban rythms with African traditional beats to create what is now universally known as Congolese music. A true pioneer, Kabaselleh was the first African musician to create his own recording studio, Subourboum Jazz. This studio produced high quality recordings and recorded albums not just for Africa Jazz but for other up and coming bands such as TP OK Jazz. This entry was posted in African musicians and tagged Lingala music, Pepe Kalle, Soukous. Bookmark the permalink.